What a crazy, crazy game. Letting children in for free is the normal precursor to a stultifying 0-0 snore draw, but that particular form book was dispensed with as both defences gave the dozen or so Santa Clauses in the crowd lessons in Yuletide generosity. Both sides could have won it, so a draw is about right. Should you change a winning team? Jim McIntyre did - replacing Harper and Bell with Loy and Burke, but decided not to reinstate Wilson as he returned from suspension with the Pars seeking to end a 3 match home losing run. So it was an unchanged back 5 that took the field in black and white stripes, defending the Norrie McCathie end: Gallacher in goal, a central pairing of Shields and Thomson and McCann and Woods as the full backs. The captain Stephen Glass looked to play the holding role in midfield just behind Phinn and Burke on the left, with Loy wide on the right hoping to get forward and support Bayne and Kirk up front.. Holmes reappeared on the bench, alongside Wilson, Harper, Reidford and the manager, but no sign of Ross, and Bell had to make to with lurking around the tunnel lest there be any injuries warming up. The Pars could scarcely have got off to a worse start. Twenty nine seconds on the clock and Thomson and Shields were already having an inquest as Trouten found space both to bring a ball from McLaren down then bury it past Gallacher from 8 yards. 1-0 Clyde. One minute later and again the Pars’ back line looked shaky as Gallacher had to dive to save Gemmill’s cross from the Clyde left. However the home team levelled matters in the 10th minute. Glass had switched play to send McCann free on the left and the left-back won a corner. Glass swung it in, Bayne was pushed and Richmond pointed to the spot. Glass is deadly from 12 yards (assuming the turf doesn’t give way, but then East End Park isn’t Firhill) and dispatched the Pars first penalty this term low to the keeper’s left. One all. There was more comedy defending from the Athletic in 13 minutes - Shields got the ball tangled in his feet in the half way line and lost possession; Thomson slipped as the cross came in and McCann managed to miss it as well, Woods eventually blocking McLaren’s shot for a corner when the ball was returned to the danger area. Gallacher gathered the corner and sent Phinn clear up the right but the midfielder delayed his pass to Loy, much to McIntyre’s displeasure. The Pars had settled down now and were beginning to look marginally the better of the two sides. Bayne and Loy tried a 1-2 but the centre-forward’s return was clumsy, and Kirk was tackled mid-way through the half as he headed on goal but won another corner. Keeper Hutton had to palm over a mis-kick from his defence as Glass fired the ball in at the second attempt. Like Queen of the South last week, Clyde were looking to play 5 in midfield and stifle the Pars’ attempts to create. Kirk sprung the off-side trap in 30 minutes and caught the ball on the bye-line, but Burke scuffed the cut-back off target. 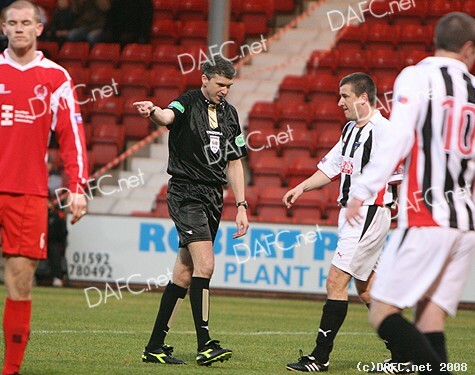 Referee Richmond took exception to Bayne’s flying leap for the ball in 32 minutes, flashing the yellow card before becoming the centre of attention 5 minutes from the break, falling in a heap as the Pars surged forward through Loy. After treatment from the Pars physio, he was able to resume, although declined to wave himself on from the sidelines. Scott Gemmill was less lucky with injury and was replaced by Waddell as the half finished level. With Sammy the Tammy being spurned twice as he tried to shake Bomber Brown’s hand, there was a much slower start to the second half with the first goal taking all of 90 seconds to arrive. The Pars won a throw in front of the North West stand, and from Woods’ cross Kirk found himself alone with the ball 8 yards out - Lithgow and Gibson had already started their own inquest as the Northern Irishman made it 2-1 Pars. One minute later and it was nearly 3, Loy’s accurate cross finding Bayne at the back post, who had all the time in the world to pick his spot. Unfortunately his spot was keeper Hutton’s gloves and the chance was missed. Up the park came Clyde, with Woods being forced to concede a corner. Not a problem to defend, we thought, but Higgins rose unchallenged at the back post with a firm cross-goal header to equalise again. Two each. Down the park came the Pars, Loy turning his man before sending in a near post inswinger which Kirk sent spinning over the bar under pressure, picking up a knock in the process.